Love wine but hate spending a fortune on mediocre bottles from the local shop? 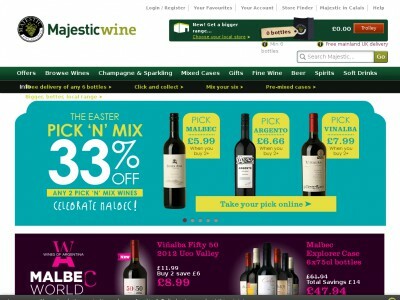 Why not stock up in advance and save money with a Majestic Wine promo code? Whether you've got a big party coming up and want to have plenty of supplies or you just appreciate a bottle or two of fine wine throughout the week, a Majestic Wine voucher can help you sample some of the world's best vino without breaking the bank. Founded by wine expert Sheldon Graner in 1980, Majestic Wine was set up to combine Graner's retail experience with the John Lewis group with his passion and hobby as a wine broker and trader. After the first store opened in London, the concept proved popular with wine lovers and the company grew and grew – opening its 150th store in 2009. Today, Majestic Wine is the UK's largest retailer of mixed wine by the case, having won several awards for their competitive prices, excellent customer service and and impressive range. As specialists in selling quality wine by the case, Majestic Wine believe that wine is something to be savoured and enjoyed – and their extensive online collection reflects this belief. Got a big party or special occasion coming up and want to make sure your guests have plenty of brilliant wine to choose from? With Majestic Wine you can put together your own mixed case from their selection of delicious red, white and sparkling wine, or buy one of their pre-mixed cases to get the party started. Just looking to top up your wine rack with some tempting vintages? In 2012 Majestic Wine reduced their minimum order from 12 to just 6 bottles – perfect for the casual drinker that appreciates a fine wine with dinner or to share with friends. At Majestic Wine the team are dedicated to seeking out wines that are that little bit special – the sort of wines that are difficult to find in the supermarket or corner shop. They make it easy for their customers to try new and exciting wines, without ever paying over the odds. All you need to do is log on to their website, choose the wines that suit you and wait for their speedy, secure delivery service to ship your order direct to your door in record time. Want to get shopping with Majestic Wine? With a Majestic Wine promo code you can enjoy fantastic savings on your choice of whites, reds or mixed cases. So whether you're crazy for Chianti or mad about Merlot, a Majestic Wine discount code will help you taste the best for less. Only 6 bottle minimum order. Browse our website until you find a Majestic Wine promo code that suits you, then navigate to their website to begin shopping. Click on a product for more information, then click 'Add to trolley' to buy. When you're finished shopping, click 'View trolley and checkout'. Enter your Majestic Wine discount code in the box provided and click 'Apply'. Want to find out more about the fantastic wines on offer at Majestic Wine? Why not pay a visit to the company's dedicated YouTube channel? You'll find loads of amazing content such as wine facts, tasting tips, cocktail recipes and much more. You can also use this page to find out more about saving money with Majestic Wine offers. If you've enjoyed shopping for quality wine with Majestic Wine, you might like to check out more great deals on wine and food with Tesco or Ocado. Or, if those aren't right for you, you'll find plenty more stores in our Food and Drink section. Enter your Majestic Wine promo code in the box provided and click 'Apply'. Fill in your details and click 'Proceed to delivery'. Need to contact the team at Majestic Wine? Whether you have a question about your order, want some advice on choosing the right wines or simply want to know more about saving money with a Majestic Wine promo code, you can contact the Customer Services department by by accessing the online help centre here. Want to find out what's happening behind the scenes at Majestic Wine? The company maintains a profile across all the major social networking platforms. Follow them for exclusive content such as competitions, wine buying tips, industry news and more. You can also use these pages to find out more about saving money with Majestic Wine offers. Don’t forget to check them regularly, as you can never be sure when a free Majestic Wine voucher might be waiting for you! Buy now online at www.majestic.co.uk/. Whenever I host a dinner party or have friends round to stay, I use a Majestic Wine promo code to make sure there's plenty for everyone to drink. At majestic.co.uk you can take your pick from a wide range of red, white or mixed cases – Majestic Wine offers something to suit every budget and taste. I use my Majestic Wine voucher to stock up on rich, fruity reds and winter and crisp, refreshing whites in summer – perfect for entertaining. Why not see what you could save with a Majestic Wine discount code?